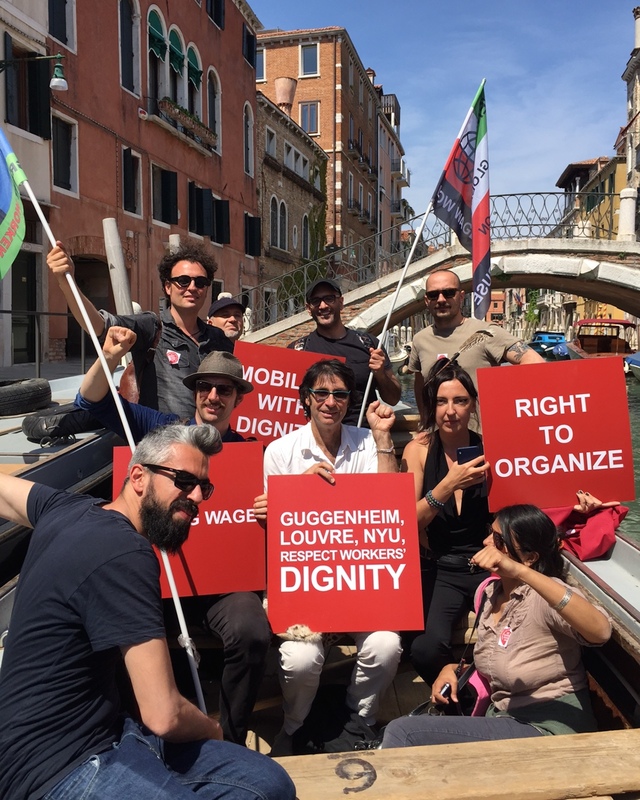 VENICE — At 10:20am this morning, two boatloads of artists and activists occupied the dock landing of the Peggy Guggenheim Collection (PGC) in Venice. 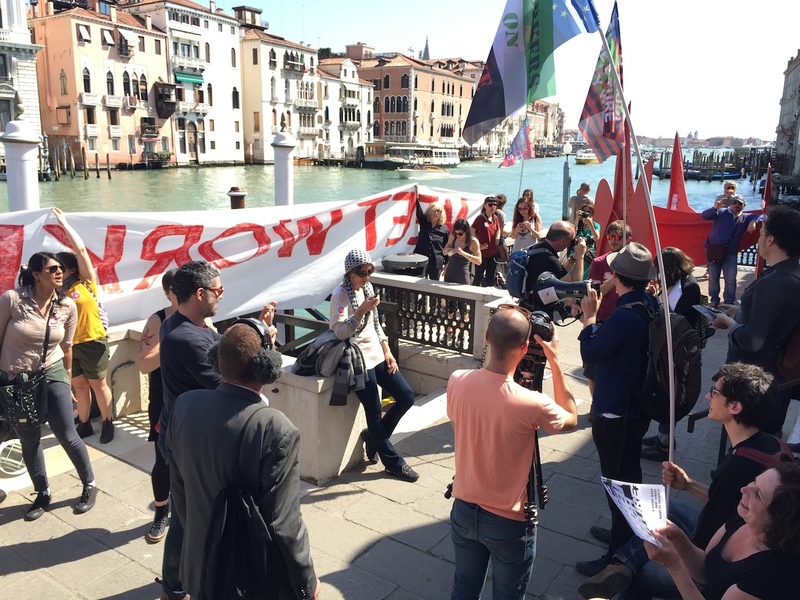 It marks the first joint action between GULF (Gulf Ultra Luxury Faction) and Gulf Labor, which is an official participant in the 2015 Venice Biennale, and two Italian organizations, Sale Docks in Venice and Macao from Milan — an independent art space which started organizing art workers in 2012. The crowd of roughly 40 people are hoisting banners and flags that read, “Meet Workers’ Demands” and other labor-related messages. 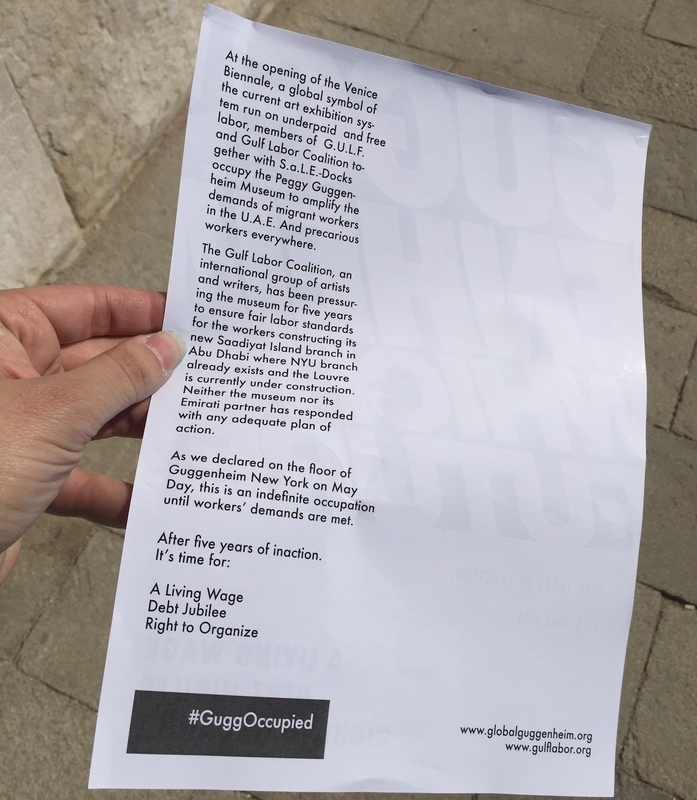 The museum occupation is the latest effort to highlight labor issues impacting migrant workers at Saadiyat Island, where Guggenheim Abu Dhabi, Louvre Abu Dhabi, and other luxury culture brands are building outposts. 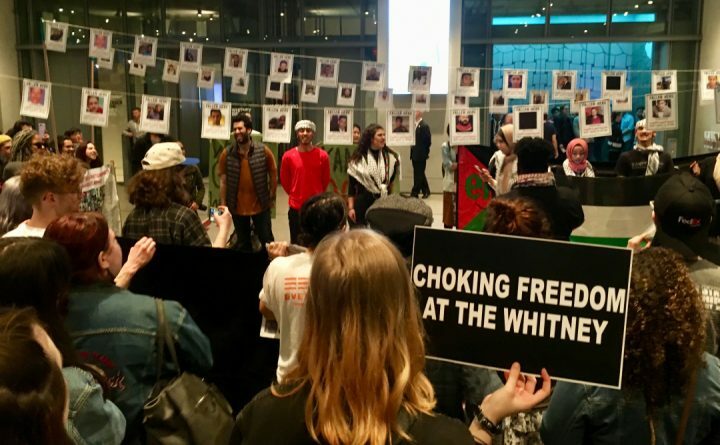 The event is the first “official” event of Gulf Labor’s Biennale participation, according to New York University professor Andrew Ross, who made headlines in March when he was banned from visiting the United Arab Emirates. 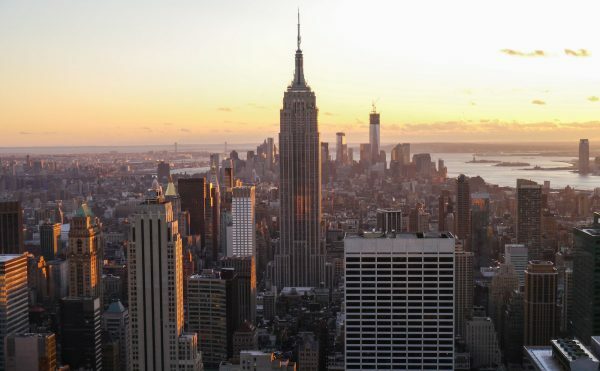 The intent is to have a continuing, perhaps roving, occupation as a way to mimic the worldwide reach of corporations. 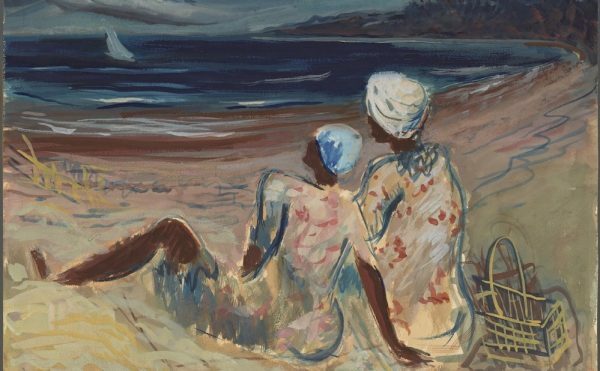 “The museum behaves as a global corporation so it has to reflect that global nature, and it should happen in Bilbao and elsewhere until they respond with a call of action,” says Nitasha Dhillon of GULF. 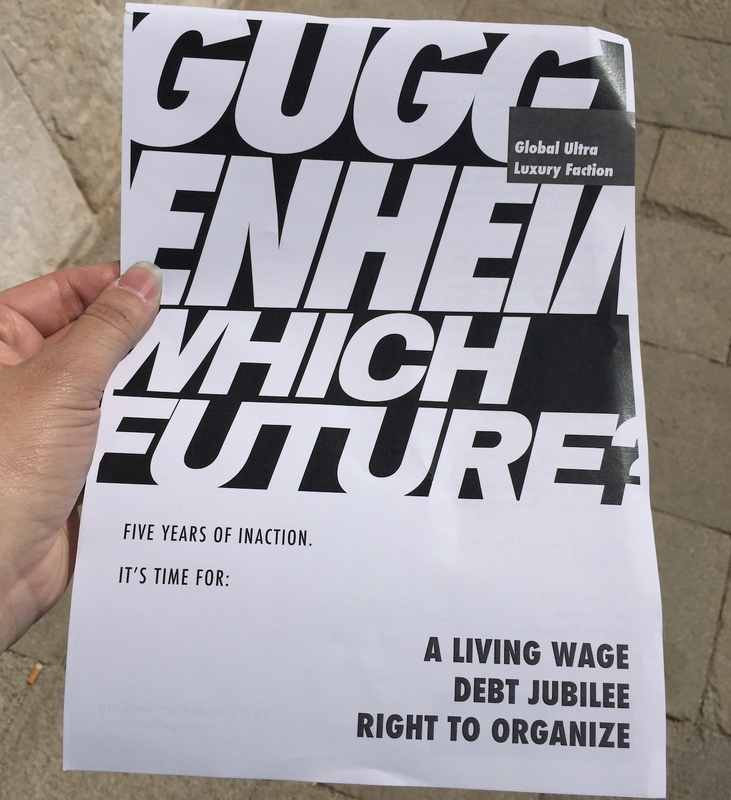 Gulf Labor is an invited participant in the 2015 Venice Biennale’s central exhibition, All the World’s Futures, which is curated by Okwui Enwezor. They are a coalition of artists, writers, architects, curators, and other cultural workers who have been working to ensure that “workers’ rights are protected when contemporary art, precarious labor, and global capital intersect.” The group is planning to produce a public report in a series of plenary sessions dedicated to its investigations of labor conditions in the Persian Gulf and South Asia. Update, 11:30am Central European Time: The PGC, which is ordinarily open from 10am until 6pm on Fridays, has locked protesters and the public out. 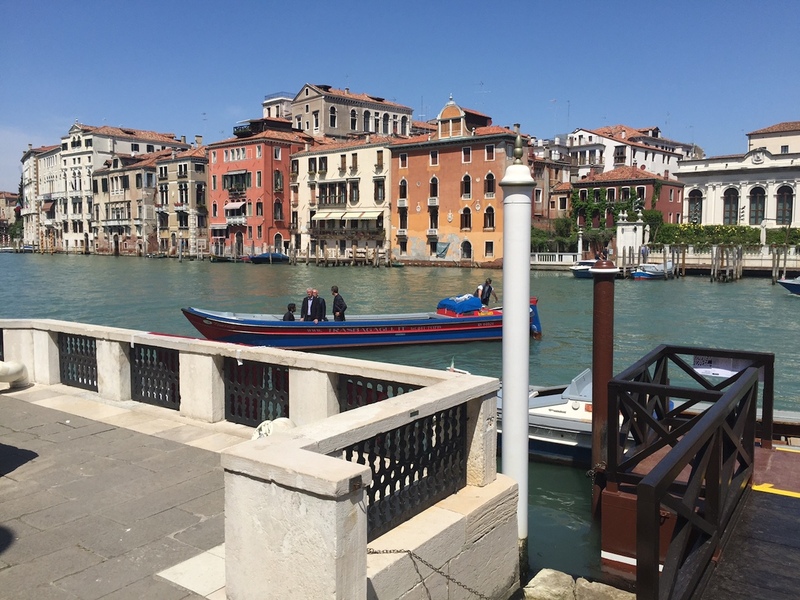 The museum locked its gates facing the Grand Canal before the boats carrying the protesters had unloaded. There are police officers at the scene filming the protest. Protesters are now throwing paper planes fashioned from the flyers onto the museum grounds. The protest’s most surreal moment came when a seemingly armored boat carrying men in all-black army fatigues passed by the museum. They were not police officers, but participants in a performance art piece by Harold de Bree and Mike Watson titled “Machines of Loving Grace” (2015). 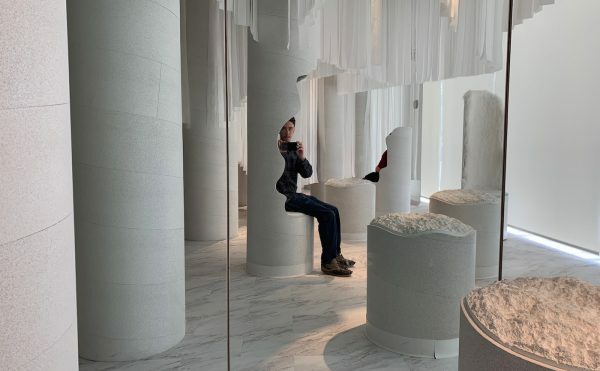 The performance is part of a Venice Biennale collateral exhibition, Jump into the Unknown, on view at the Palazzo Loredan dell’Ambasciatore. 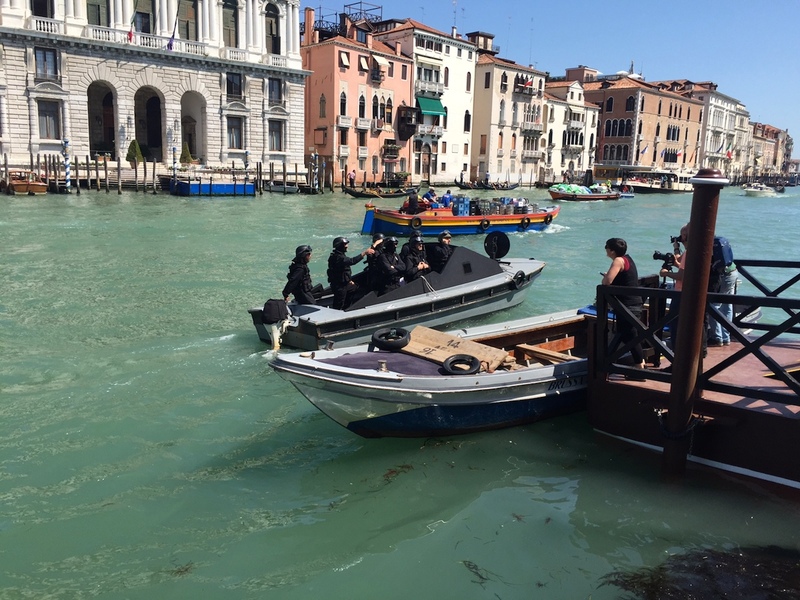 Update, 12:30pm CET: Some guests arriving at the PGC by boat are being turned away. 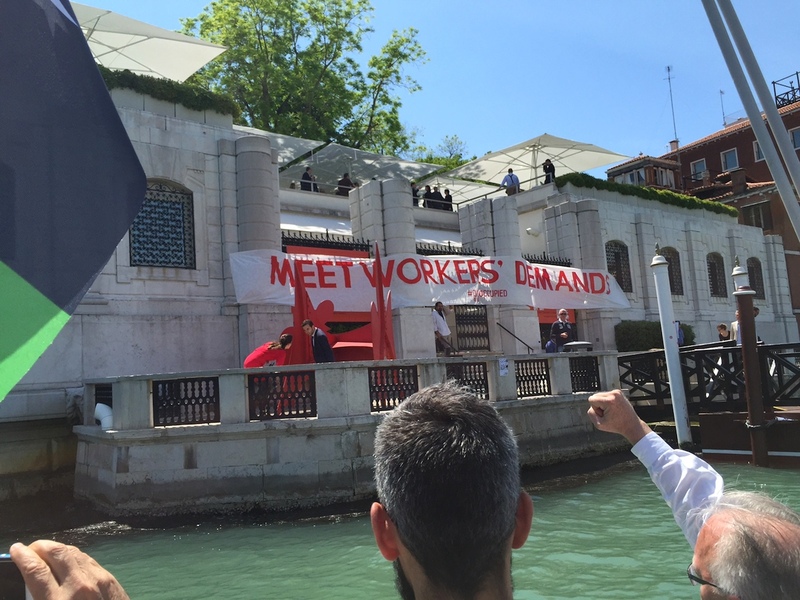 Update, 12:43pm CET: Officials from the Guggenheim have agreed to meet with the protesters. 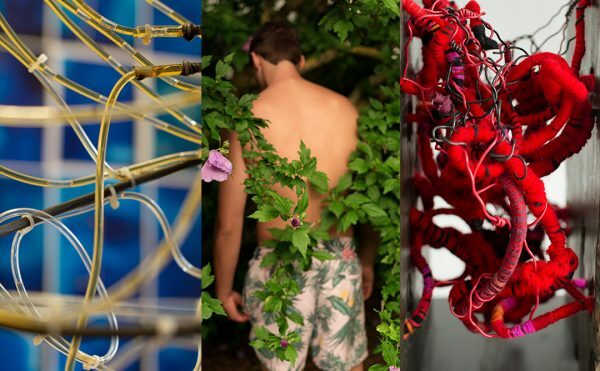 Tonight the PGC will host an official party for the US Pavilion at the Venice Biennale, which the US ambassador to Italy is expected to attend. The Solomon R. Guggenheim Foundation, which runs the PGC and is building the Guggenheim Abu Dhabi, owns the US Pavilion in Venice’s Castello Gardens. Update, 12:52pm CET: The PGC is closed and those people who did manage to get in through its other entrance have been ejected. 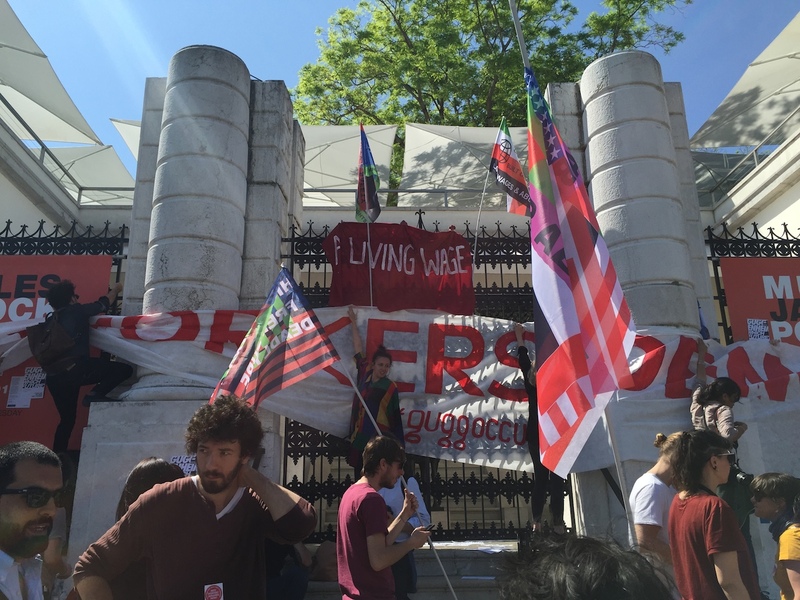 Update, 1:32pm CET: The occupation of the PGC has ended. The protesters’ signs and “Meet Workers’ Demands” banner are being taken down. 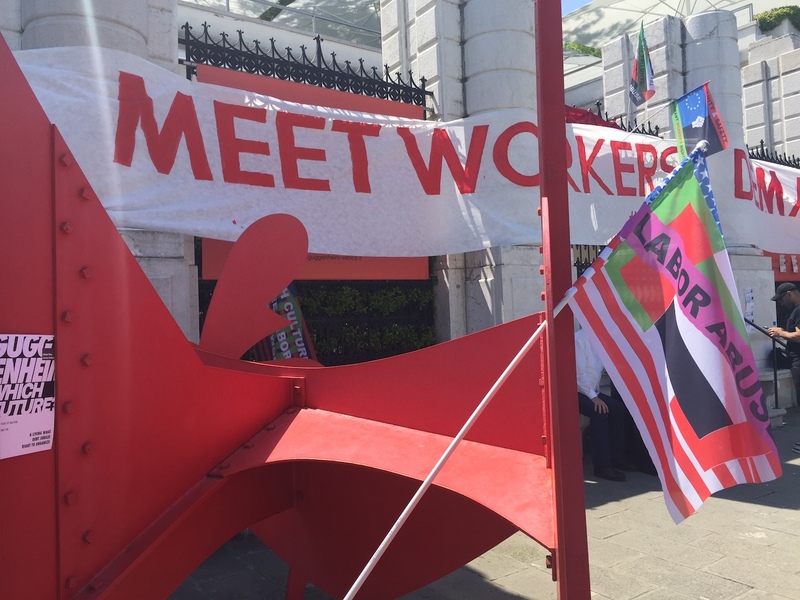 Update, 8:10pm CET: Guggenheim Director Richard Armstrong has responded by calling Gulf Labor to set up a meeting with museum trustees.